I own a Deagan Vibraharp No. 35 Rondo, and I am trying to find out how much it is worth. I have contacted the Deagan factory in Chicago and was told by Mr.Serna that he would hold it in his show room and give me $450-600 if it was sold. This leads me to believe it is worth much more than that since he would be taking a cut out of the sale as well. Does anyone have ideas or resources to find the amount it is worth? I have searched high and low, but am having troubles coming up with any solid numbers. I will post a link to my model instrument (not my instrument in particular). I am still in my search for a Deagan Imperial. There are several things I have learned about these beautiful vintage instruments. First and foremost, Gilberto is a straight shooter in my experience. Yes, if that is what he offered you, I think that is likely what it is worth to him. If he sold it, he would fix it first and make a profit likely. He is in business to do that. However, I have never in all my years of playing vibes, heard anything bad at all about his business practice; quite the contrary, everyone I know who has dealt with him speaks quite well. Secondly, the value of these instruments is incredibly variable. At the high end, one like I am looking for, fully restored with cases, will likely wind up costing me $4500+. On the lower end, the older instruments without graduated bars, a single speed motor and unstable, rattling frames often sell on eBay for $200-$300 dollars. If you want another opinion, I would ask Bill Youhass at Fall Creek Marimbas. Again, the value you can expect to hear is what he would be willing to invest in something that he would have to spend time and money fixing, then hope to resell for a profit. Good luck. 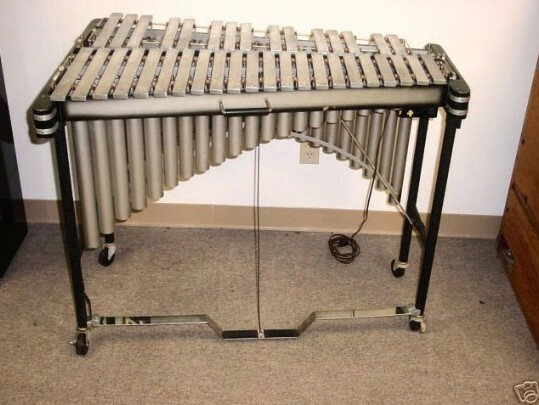 ...and, if you run into an Imperial (55 or 55A), PLEASE LET ME KNOW> For that instrument, I will make you a very fair offer in almost any condition if the bars and resonators are intact. I came across this looking around. I don't know if this is still available; the post is pretty old. I have been trawling the net as well. I actually ran down that lead several months ago. I have Google alerts set up if anyone posts anything, for instance on Craigslist... I have the usual suspects (Gilberto, Shannon, Bill)and lots of other folks like the guys up at Carroll Musical Instrument Rental in NYC on the lookout for me. My guess is that, since this instrument has fallen nearly completely out of favor and nobody but me seems to seek out playing on one any more, that it will be found in the back of a practice room, auditorium, or an attic where it has been lying dormant for 40+ years. In fact, Bill may have found me one such instrument, but he hasn't had a chance to go back to the college where he knows it is. They asked him to fix it up and tune it a few years ago, then balked at the price of the restoration job because all the players preferred the newer instruments with slightly wider bars, less stray overtones in the lower bars, more projection, ability to half-pedal, etc. Ironically, the one thing I like best about this particular instrument is something that players (including myself) generally dislike because it is something that really makes it tough to sound good doing solo vibes stuff. The damper system is VERY stiff and will buzz against the bars if you don't have an extremely deft foot. Even if you do, you will get a little of that sound (we all grew used to it with Milt Jackson). The return is far superior control over foot dampening, which is a real blessing when playing bebop, especially in a two mallet way. That and the sound of the bars is what I want. Thanks again for doing a little search for me. Never hurts to mention anything. I very well may have missed it. The search rolls on. i tried to email you at the above email but they bounced. Can you e me at brad@poulos.com??? I paid $500, knowing that it would need some restoration. Model 30s in good, playable shape seem to go for about $1,000 and restored ones, $1,500. But since the 35 is more desirable to anyone except those looking for small size and portability, I would guess that the 35 would be worth about 30% higher in all regards, i.e., $800 for one needing restoration, $1,500 for a playable example, and $2,250, restored. My father-in-law bought this Deagan Imperial and played it from the 40's until his death 10 years ago. He played it for fun and lived in the Washington, DC area at the time. I am finally willing to let go and part with it. The motor doesn't work but the bars seem to be in good shape with a couple of scratches. My dog damaged some of the mallets. A few of the 45 records broke years ago in moving but I still have a Lionel Hampton music book & some 33 LP's. I've heard of Gilberto Serna. Is he still at Century Mallet Service? I would like to know the proper way to start estimating its value then finding it a good home where it will be used and not sitting behind a door collecting dust. It does come w/ a dust cover that probably was made in the 40's. Thank you. I can send pics once I learn how to post them. I tried to send you an email, but it may not have gotten through. In my opinion, that is a fair price if Gilberto Serna is going to handle the transaction. The market is fairly limited since it's a older narrow bar vibe. The Model 35 is Way way different than a Graduated Bar Imperial or Aurora (which could go for $4000 or more restored). The sound of the 35 is quite nice, however, the lower bars don't speak as well compared to the lower bars on a graduated width vibe. You'd need mics even if you played with an acoustic trio. If I remember correctly, similar older 3 octave deagans go on Ebay for 700-900. Shipping is a lot as well and should be considered in the sale. One way to get a value with little risk would be to put it up on Ebay with a reserve price (or starting bid) and local pickup. I'd be willing to bet if you put $1000 on it, you would get no takers. Again please consider this as my opinion only and is a data point. Your experience may be very different.